April 6, 2017 | 8:50 a.m.
As farmers head into a new growing season, the supply of Wisconsin's biggest agricultural products is becoming extraordinarily large. A glut of milk and cheese has had the dairy industry struggling with lower and more volatile prices for a several years. Now there's growing price uncertainty on the horizon for soybean growers. Soybeans are Wisconsin's second-biggest crop by acreage, second only to corn. In 2017, farmers are on track to devote a record amount of acreage to soybeans, which could lead to a much bigger harvest but also lower prices. These market conditions and the state's farming outlook for the season were discussed by a trio of Wisconsin agriculture observers in an April 3, 2017 interview on Wisconsin Public Radio's The West Side. Brenda Boetel, an agricultural marketing specialist with the University of Wisconsin-Extension and professor of agricultural economics at UW-River Falls, noted that favorable weather and early plantings could make for a bumper soybean crop. However, she added, "unfortunately that just probably means that we're going to see lower prices." Boetel said that soybean futures are already down from where they were at this point in 2016. 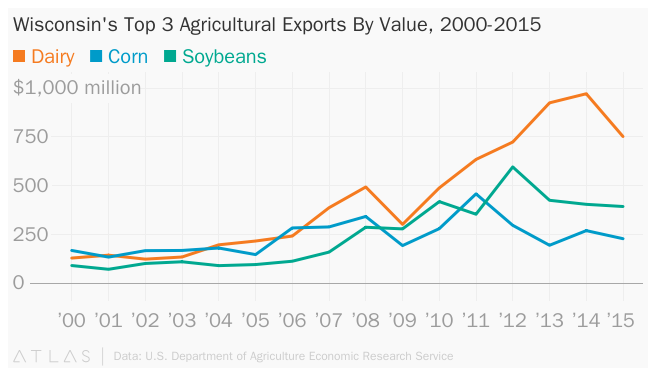 That said, soybeans can still make a lot of economic sense, as she noted demand for soybean-based products is growing. Jim Holte, president of the Wisconsin Farm Bureau Federation, said that in some ways, soybeans may be less risky than corn, which is also expected to have a big year. "The prices up until the last month or so have kind of indicated a little bit of an advantage to beans," he said. Several factors can lead individual farmers to favor soybeans over corn, said Jerry Clark, agriculture agent for UW-Extension Chippewa County. "The overall cost of production per acre is cheaper for soybeans," he said. In addition to that, Clark added, soybeans are more resilient than corn in harsh or unpredictable weather. As a comparison, Clark described how Wisconsin's focus on cheese processing, rather than simply producing milk, makes the state's dairy industry a bit more resilient than other places when milk supplies are larger. "We know from a nationwide perspective that [in the northeastern United States] they don't have the [cheese] processing to handle the flush of milk." Clark said. In Wisconsin, though, cheese and other dairy product plants are better able to keep up with the supply. Concerns over milk, soybeans and corn supplies also strikes at Wisconsin's dependence upon export markets. Not only do those three products dominate the state's agricultural industry, but they're likewise the agricultural commodities Wisconsin exports most. A national or global oversupply of either, then, makes it tougher for Wisconsin farmers to find overseas buyers and good prices for their products. "We export a fair amount of the products we grow in agriculture, and so when that export fades away or backs off, it impacts our local prices quite quickly and in some cases quite extremely," Holte said. Boetel, Clark and Holte all expressed concern over President Donald Trump's stance on international trade, especially his decision to remove the United States from a proposed international pact called the Trans-Pacific Partnership. Hillary Clinton also opposed the TPP, so a U.S. withdrawal may have happened no matter the outcome of the 2016 election. Boetel found that action disappointing from an agricultural perspective, because the TPP might have sped up the process of getting Wisconsin-grown products into Asian markets. "It was good for agriculture, and it was primarily when we look at it from the value of beef and pork, because it gave us opportunities in those Asian and southeast Asian countries that are going to be more challenging to come by," she said.